note: Preacher, both TV series and the comics series upon which the show is based, contain graphic violence, deeply mature themes, deeply immature themes, sexual frankness and deviation and no small amount of content of a religious nature which many-a-good folks would reasonably find offensive. You can read this post, watch the TV show, or read the comics, but you've been forewarned, you're on your own, and your mileage will vary. 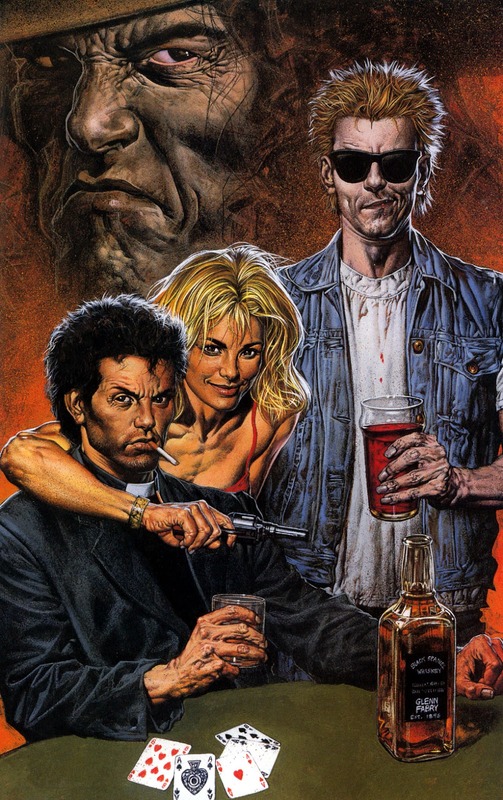 Last year, Preacher came to television via AMC - arriving as a sort of high octane dramedy and a loose adaptation of the original comics which ran from 1995-2000 under DC's Vertigo imprint. The second season is now underway, but I only made it fifteen minutes into the first episode of this year's offering before saying "You know, I'm good. Let's not watch this." You can do well with a superhero comics adaptation so long as you remain basically true to the intention of the authors, or - in the case of serial comics - find that core to the characters and concepts that have brought readers back, year after year, outlasting almost all other forms of long-time serial publications in the states.